The United States Army is getting ready to release a lineup of officially-licensed U.S. Army-branded videogame accessories. The United States Army - yes, that's the real, actual Army - has teamed up with videogame peripheral maker CTA Digital to develop and release a lineup of U.S. Army-branded game accessories, including backpacks, headsets and of course game controllers that look like machine guns. Why? Because the military - that's the real military, the one that invades countries and shoots people and all that sort of thing - wants all you couch potato button-mashers to "take pride in Being Army Strong." The two Assault Rifle controllers will operate like DualShock controllers, with buttons and thumbsticks positioned for maximum comfort and usability for both right and left-handed players. The Move-exclusive Sniper Action Rifle, meanwhile, features removable scope, stock and muzzle, allowing gamers who'd rather be first through the door to convert it into a lightweight shotgun. I must admit that I'm having a hard time grasping the rationale for this lineup of game accessories. Surely there will be a lot of people more than just vaguely appalled by the idea of the Army getting into the game accessory business - the strong reaction to the "Army Experience Center," essentially an arcade designed for recruitment purposes, is a sure sign of things to come - so what's the payoff? Are we hearts and minds-ing our own population these days? Is this some kind of fundraiser for the upcoming invasion of Iran? Or is this just one of those ideas that nobody really thought through before giving it the green light? Whatever the reasoning, I expect we'll hear no small amount of hue and cry when these things hit the store shelves. 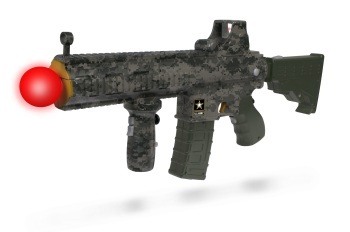 I also have to wonder if, having decided to release its own series of gun-style controllers to the general public, the Army will now allow its soldiers to buy Medal of Honor in its on-base stores. CTA Digital's official U.S. Army videogame accessory lineup is "coming soon" to major retailers.